TAORMINA, Sicily (CNN) - World leaders gathered here engaged in a heated argument over combating climate change, a major point of dispute between G7 heads of state and President Donald Trump, who is considering withdrawing from the landmark Paris climate accord. The rift is one of several emerging disagreements between Trump and other world leaders, who are gathering at a cliffside resort here for the first summit of the new US President's tenure. Differences over trade and Russia have also arisen in talks. "I think he learned how important it is that the United states show leadership," Trump's chief economist Gary Cohn told reporters. 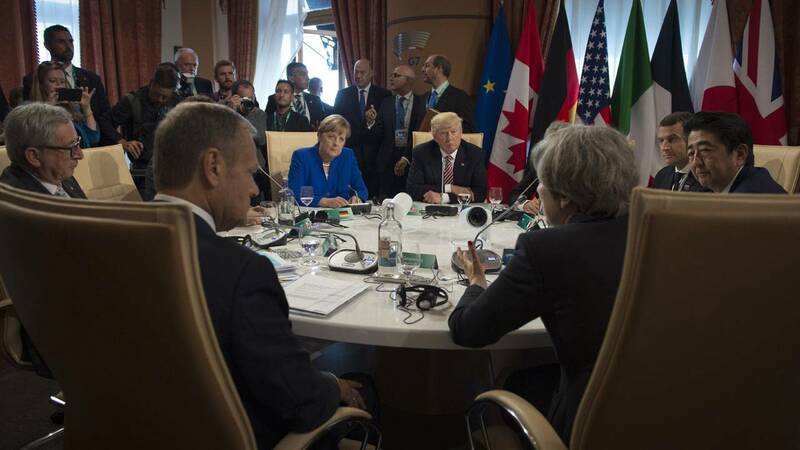 "That was a big topic where many of the European leaders talked about these global agreements ... without the United States it's sort of missing a big gap when you take the biggest economy out." He said Trump allowed the other leaders to speak before voicing his own opinions of the subject. "He did say the environment is very, very important," Cohn said. "He didn't want anyone to think he didn't care about the environment." Trump had initially planned to announce his intentions on Paris before arriving here for the G7. But earlier this month the White House said Trump needed more time and wouldn't make up his mind until returning from Europe. While here, several of Trump's fellow leaders have raised the matter with him, including the newly elected French President Emmanuel Macron and Belgian Prime Minister Charles Michel. Top US administration advisers have been in a heated debate over the Paris accord, which Trump vowed to exit as a candidate. The issue has divided West Wing advisers. Chief strategist Steve Bannon and Environmental Protection Agency director Scott Pruitt have pressed Trump to withdraw. The President's daughter Ivanka Trump, a senior White House adviser, has advocated for remaining in. Trump's White House counsel further complicated the debate by raising legal concerns over the possibility of reducing US carbon reduction commitments. Drafters of the Paris agreement intentionally left the language about adjusting those commitments vague. "He feels much more knowledgeable on the topic today," Cohn said. "He came here to learn. He came here to get smarter. He came here to get world leaders' views." "His views are evolving" on the Paris climate agreement, Cohn said.